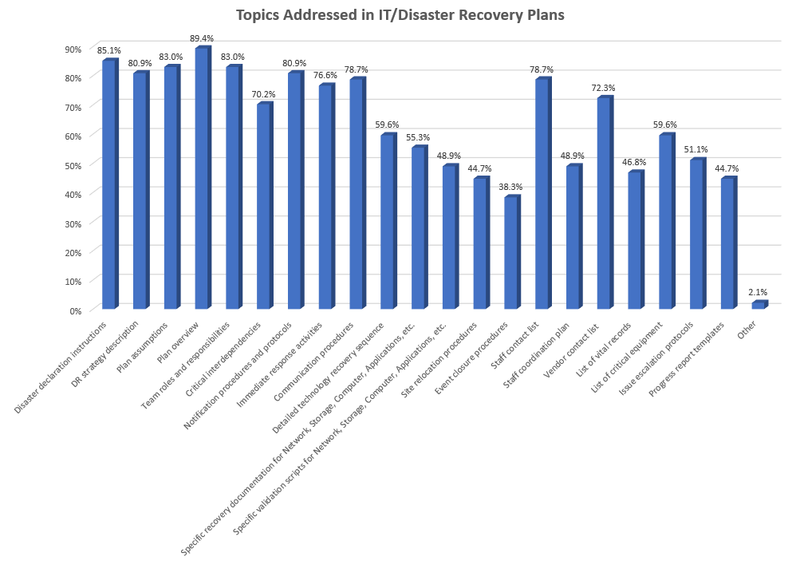 What Topics are Addressed in IT/Disaster Recovery Plans? - BC Management, Inc.
What Topics are Addressed in IT/Disaster Recovery Plans? Two Weeks Left!!!!! Participate in our 2nd Annual IT Resiliency Planning Assessment by September 9th to Ensure Your Complimentary Report! Only study participants will receive our complimentary IT Resiliency Planning Report, which includes an assessment from our International Benchmarking Advisory Board. This survey will be used to assess how organizations are approaching their IT/DR/ Resiliency program. What are the current trends in IT Resiliency Planning and how are the most mature programs achieving success? ​Benchmarking. Plan Ahead. Be Ahead.